This little-known but revolutionary book appeared in 1982, and was the first to show the value of using partial capos to play simplified guitar chords for children, beginners or people with hand injuries or special needs. It has been used since then in many music education and music therapy curriculums. It is still in print and you can easily buy one. You can start strumming accompaniments to the 29 basic and children's songs with the one and 2-finger guitar chords. The "regular" basic chords that guitarists have had to learn for centuries take 3 fingers of the left hand, which is tough even for adults with musical talent. The simplified "Duck Soup" chords are dramatically easier, and sound just as full, and you can usually strum all the strings and get a nice big sound. 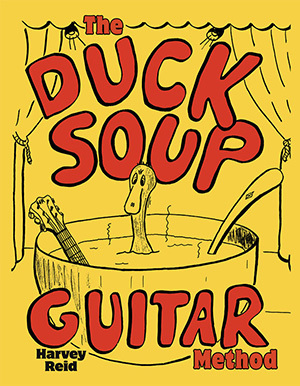 The Duck Soup book shows 6 different ways to use a partial capo to play easier chords. 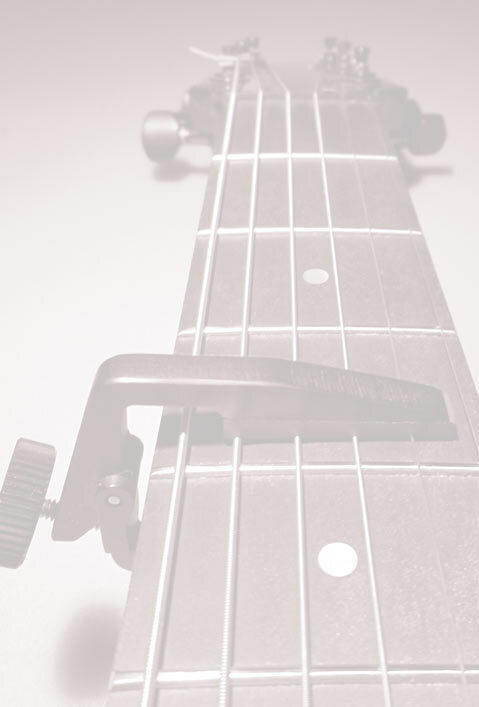 To play them all you'll need a "universal" partial capo like the Third Hand or the SpiderCapo, but you can do most of them also with the 3-string "Esus" partial capo made by Shubb or Kyser. Until the arrival of the Liberty Guitar Method in late 2013, this was the best way ever devised to simplify beginning guitar chords, and it is easier to implement than using open tunings or muting a lot of strings, as are often done. As is the case in using an open tuning, there are added or missing notes in most of the basic chords, which don't always sound right in every song. You are also limited to playing 1-4-5 chord changes, since there are no simple chord fingerings for minor chords, or 2, 3, 6, or 7b chords that are common in so many songs. (This is not the case with the Liberty Guitar Tuning.) You are also limited to playing in the key of E and sometimes A, since the partial capo takes advantage of the open string pitches of the guitar. (Though there is a method in the book for playing in C with a universal capo, which is great for classroom use, since so many instruments play in C.) So you might not end up in the right key for your voice for a particular song you want to sing, and it may take some experimenting, and you'll want to have a full capo to combine with the partial capo to get the easy chords pitched in the best key for your needs. Everything you need to know about strumming, tuning, singing and following songs is right here. It's a perfect way to start playing the guitar... You'll develop your rhythm and strumming skills, left-hand chording, and confidence as you sing these familiar songs. The skills are sequenced in a natural progression, so that when you finish Duck Soup Guitar you'll be ready for "conventional" guitar programs. It makes learning to play guitar easy and fun... You can play thousands of 3-chord songs with the "Duck Soup" method more easily than the 2 chords that are usually used for beginning guitar.